There is a complicated set of readings in the Revised Common Lectionary (RCL) for Sunday week, Palm Sunday, 29 March 2015. For the Principal Service, the provided readings for the Liturgy of the Palms are: Mark 11: 1-11 or John 12: 12-16; and Psalm 118: 1-2, 19-29. And for the Liturgy of the Passion, the readings are: Isaiah 50: 4-9a; Psalm 31: 9-16; Philippians 2: 5-11; and Mark 14: 1 – 15: 47, or Mark 15: 1-39 (40-47). For our Bible study this morning, I have chosen to look briefly at the shorter Gospel reading for the Liturgy of the Palms. 11 Καὶ εἰσῆλθεν εἰς Ἱεροσόλυμα εἰς τὸ ἱερόν: καὶ περιβλεψάμενος πάντα, ὀψίας ἤδηοὔσ ης τῆς ὥρας, ἐξῆλθεν εἰς Βηθανίαν μετὰ τῶν δώδεκα. Like most of us, I’m sure, I find myself wondering are these delays going to get in my way, going to delay me, am I going to get stuck, to be late. ● The bus driver who has a full load of passengers, each of whom complains in a nasty way because the bus has broken down. But who thanks him when he is on time, or when he squeezes in a few more people, even if it means breaking the rules. But, by now, I am stuck behind one or more of them. I am wondering why they are not moving. Did the lights not change to green 10 minutes ago? Why am I stuck here? Do they not know I am late? Do they not care? We have all been there, stuck in that traffic jam, stuck in that car. If Christ was to enter the city this morning, I could imagine he would create the same problems. Just imagine it. Telling two of the disciples to go down the road, say to Nutgrove, where they can find a fairly new car, a 2012 car, waiting for them. And so the disciples happily fit out the car, and off they head with Jesus into Dublin. As they arrive at Rathmines, the crowds are gathering. This is a big show. They follow him in a convoy, whooping and hooping. By the time they arrive in the city centre, AA Roadwatch is already warning people that a bottle neck is building up. ● Did anything good ever come from Nutgrove? ● Do they not know a big match is on today? ● Do they not know we are still recovering from celebrating Saint Patrick’s Day – why do they bring religion into everything? That chaos, that turmoil in Jerusalem, in the days immediately before Christ’s death, echoes the chaos in the city in the days immediately after Christ’s birth. The last time there was such a fuss in Jerusalem in the life of Christ was just after Christmas. Saint Matthew records that Herod became seethingly jealous and outraged at what the Wise Men said when they called to visit him. He tells us: ‘When King Herod heard this, he was frightened, and all Jerusalem with him’ (Matthew 2: 3). So, in the first Gospel there is a link between the birth of Christ and the death of Christ, between the arrival of the three kings in Jerusalem after Christmas and the arrival of Christ as king in Jerusalem before Easter. With Palm Sunday we enter into the last week with Christ in the days before his Crucifixion. 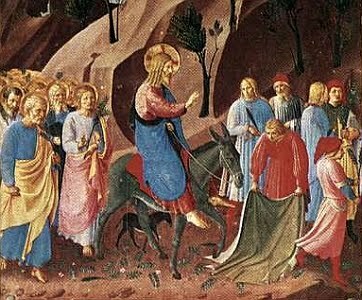 In Saint Mark’s account, Christ arrives in Jerusalem on Palm Sunday to great solemnity. 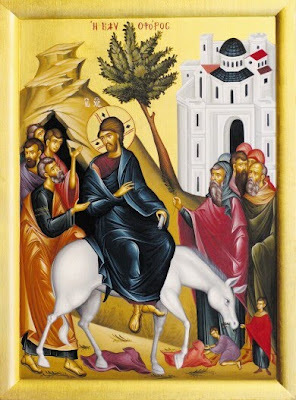 Saint Mark’s description of Christ’s triumphal entry into Jerusalem sounds the note of majesty and kingship before the Passion narrative begins. But the Gospel writer gives us hints too that we should be also looking forward to Christ’s second coming. Palm Sunday begins on the Mount of Olives (verse 1) but it points to Mount Calvary. Yet it also points to the second coming of Christ (see verses 9-11), for the Messiah was expected to arrive on the Mount of Olives, and to sweep down through the Kidron Valley and up into the city, taking with him in his royal procession the living and those who were raised from the dead. Christ’s entry into Jerusalem on Palm Sunday is the entry of the king into his capital. And the crowd acclaims him as king when they say: “Blessed is the one who comes in the name of the Lord!” This phrase from the Psalms was used as a title for the Messianic king (Psalm 118: 26). Many in the crowd expected a new liberating king. But did anybody on that first Palm Sunday really realise who Jesus truly is? Their expectations of him are high, but deep down their attitude towards Christ is unchanged. For most of them, he may still be a prophet in their eyes, but that is less than he actually is. He may be a king, but they want a king who will deliver what they want, not what he has come to give them. Things get out of hand, and Christ has no control over what happens. God in Christ has emptied himself of all choice and control. Some years ago, I was taught a lesson when I saw the community in Skerries showing its true humanity, its true capacity to love, it showed Christ-like priorities, when the people gave, shared and abandoned their own priorities to search for two missing fishermen who were drowned at sea. The images that came to the fore from that community throughout that search reminded me constantly of the Good Shepherd and his search for the lost sheep. Easter gives us the hope that when we get our priorities right, when I turn from me to us, from self to relationship, then I not only become more human, but I become more like Christ-like. And, when we become more Christ-like, we become more like the person God created us to be. (Revd Canon Professor) Patrick Comerford is Lecturer in Anglicanism, Liturgy and Church History, the Church of Ireland Theological Institute. These notes were prepared for a Bible study in a tutorial group with MTh students on 18 March 2015.